Obstacles in Buhari’s path. Can Nigeria still be salvaged? Anyone who has the privilege of engaging former President Olusegun Obasanjo in a casual political conversation involving the future of Nigeria will always be struck by one of his favorite comments. The former President never relents in stressing his optimism about the future of Nigeria. “Never mind the current distractions. Nigeria survived Abacha. She will survive anything. Nigeria will be a great country” the President would always say. Today more than ever, I am forced to question the source of President Obasanjo’s optimism. With every passing day, all hopes seem to be dashed whenever a ray of light flickers through the dark tunnel. No event could be more momentous to mark the dawn of hope than the election of former General Muhammadu Buhari, who has now long been installed President of the country. Since his inception however, the nation has faced mixed signals on the prospects of ever making meaningful progress in the battle to redeem the country. If anything, the cluelessness and aloofness with which the immediate past President Goodluck Jonathan handled the affairs of governance in Nigeria ended up elevating the objective value and public perception of former President Olusegun Obasanjo, who at least, had a clear idea of what to do with governance and was hands-on all through his tenure as President. Even more strongly elevated and valued by a huge majority of Nigerians is the present leader of the country Muhammadu Buhari, whose intended policy direction in the handling of governance has been no secret to Nigerians since the day he was deposed by a rival General from the seat of power as military head of state. In a field of leadership aspirants in the 2015 contest that was conspicuously short on candidates with the requisite credentials to fight and wrest Nigeria from the grips of political hyenas, Muhammadu Buhari was the last hope of sort, to save Nigeria from itself. The nation had been set on a seemingly fast descent to the abyss. There was no doubt that redemption would be faced with obstacles and reprisals from the predators who feast fat on the blood of the sufferers and the downtrodden. While reprisals come as an aftermath of the spontaneous defense mechanism of the exploiters at the losing end, obstacles may however come from within as we have so far witnessed in the wake of the Battle Royale. President Buhari’s own health seems to be one of such obstacles that is likely being suppressed and kept a palace secret amid the long battle in its infancy stage. No one but the President himself openly expressed regrets on the heels of his inauguration, that he was elected President only this late and not in his more youthful days of buoyant health and bouncing reservoir of zest for action. As irrelevant and unimportant as they may seem, recent gaffes by President Muhammadu Buhari at home and abroad are clear and unmistakable pointers to the degenerative impact of age on the mental health of the nation’s last hope of resetting the button of progress. Starting from the mix-up of the Vice President’s name (“Osibande” for “Osinbajo”) in the heat of electoral campaign through the mix-up of Germany and West Germany or Chancellor Merkel for “President Mitchelle” up until the complete recreation of the name of his own political party (the APC), no one is in doubt that President Buhari’s mental health is not in the best of shape at least, to the point of flaws when long-drawn concentration is required. His aides are thus faced with the challenge of keeping him away from events requiring a longer period of mental concentration and scaling down on the number of events requiring unprepared speeches. In spite of all these though, the President seems very much alert in implementing his project of wresting Nigeria from the fangs of thieves that were most conspicuously installed by the government of former President Jonathan. Within two months, the fear of his name alone has worked wonders in several areas of national affairs. Projects that had dragged on and drained resources under his predecessor, now see sudden completion and progress. Refineries, whose maintenance were mandated by his predecessor in the run-up to elections but for which no one really cared in the face of the benefits reaped by fuel importers, who were mostly friends and financiers of the former President, now see sudden progress with some producing to installed capacity. Reports from the country also tell the tales of improved power supply all over the country following the successive works of two presidencies including Jonathan’s, but which exploiters would have openly sabotaged under Jonathan to reap more benefits. In a period of dwindling oil prices, Muhammadu Buhari added $2.89 billion to Nigeria’s foreign reserves as of early July 2015 barely one month in office. Accountability has risen in government departments and agencies. The nation’s account has been singularized for the remittance of funds by public institutions and leakages blocked in several areas. Quiet ‘carrot and stick’ persuasions seem to have flushed some stolen funds back into the treasury while many now sing openly on the cause and scope of the large-scale looting that reigned uncontrolled under Goodluck Jonathan. None other than the celebrated Ngozi Okonjo-Iweala, on whose shoulders the hope of the first female President of Nigeria once rested, sang very clearly, on the source of orders for her audacious and illegal withdrawal and misappropriation of funds from the Excess Crude Account. It was slowly becoming clearer to Nigerians, how funds were simply misused at the center leaving fewer funds available to be shared to peripheral states, which then ended up owing salaries to government employees partly due to aggravated corrupt practices in the states as well. It was a ray of hope flickering through the dark tunnel in expectation of a brutally honest soul-searching before the start of processes to make amends. But traditionally, Nigeria will never be itself if (in the informal language of the country) there was no “K-leg” in the smooth sail to redemption. Nuhu Ribadu once infamously remarked that corruption fights back whenever it is fought and he nearly lost his own life in the process. Yet, as far as his health allows him, Muhammadu Buhari is one character that does not seem to fear death in the course of implementing his rigorous agenda to put the country on the right path again. His clear leaning towards the northern region in picking his lieutenants notwithstanding, I will dare say that I have no problem with that at all as long as it works the magic of bringing Nigeria back to its senses. After all, a Southerner from a very small minority group had his chance like never before but chose to squander it on the altar of ethnicity and regionalism and lit the embers of renewed secessionism. Before voting Buhari as President, Nigerians were not only abhorrent of the culture of impunity and ‘anything goes’ under Goodluck Jonathan, they also knew Muhammadu Buhari as a Northerner, who loves his region and adores his religion. Thank goodness that age has also made him soften the staunchness of positions that he held on several issues in the past. As far as religion is concerned, Muhammadu Buhari is much more of a fair and balanced secularist politician in our present day. I therefore have no problem at all if the President deems only his northern friends fit enough for the near-sincere implementation of the policies that he intends to put in place for the good of the country as long as those northerners are Nigerians. After all, he has the inalienable right to pick people that he can work with and nothing else but meritocracy should be his ultimate guide. Returning to the central issue, I have stated that Nigeria will never be its true self if there was no “K-leg” in the prosecution of the anti-corruption agenda. What is however surprising is the face of the satanic resistance. When the conscientious instance of society suddenly becomes the central mouthpiece of evil, then the time is rife with prudent speculations on the fate of the sick nation. It is no secret that Nigerian has long gone nuts and questions abound if it is still capable of being salvaged. In my book “Africa’s Diabolical Entrapment”, I indicted the Christian religion in Africa as having been reduced to the conman’s springboard for defrauding unsuspecting Africans in the name of fake visions and spiritual faith. At the same time, I acknowledged the moral and ethical function of religion in society as the vanguard of political correctness. While it is largely true that the Christian faith, which has become the most flamboyant of all religions in Africa, has only successfully made headlines over several decades for the wrong reasons, it seems to have failed woefully, in its gatekeeping function of upholding moral and ethical correctness. In all the fraudulent exploitation largely practiced by Pentecostal preachers and overnight “seers” however, the Catholic Church has strongly stood out as a background voice maintaining some level of decency. So we thought at least, in the wake of one Father Mbaka’s daring outpour of the mind of ordinary Nigerians, who saw the havoc wreaked by the Jonathan government. Today, we are seeing that Jonathan also had allies within the Catholic Church, who may have also helped him advance his diabolic agenda on poor Nigerians. First, it was Bishop Matthew Kukah of the Sokoto Diocese, who came out in vehement defense of a position that is today, common only to those who feel uncomfortable with the exposure of the rot that was exacerbated in the system, by former President Jonathan. The road-boys of the former President that were given a mess of pottage to write positive comments about the former President on social media have continued the practice long after the disgraceful removal of their principal. They have used and still continue to use all forms of foul languages to describe the campaign launched by President Muhammadu Buhari. They have skewed and continue to slew facts beyond logical perceptions in the hope of getting even with Buhari over the negative image that Jonathan worked hard to assign to himself. In fact, that is all most unperturbing. Unfortunately however, the Bishop failed to specify what element of governance he felt has been neglected because the searchlight on Jonathan and his government was intensified. Following the backlash in the aftermath of this unfortunate comment, the Catholic priest resorted to relativism and emphasized the need to spread the probe to governments beyond Jonathan as if failure to probe Babaginda and imprison Obasanjo would provide divine justification for Jonathan’s crimes. Just what Kukah sought to achieve with his utterances is still a mystery to many observers. While the debate was raging and people sought to understand the merit and demerit of the unfortunate comment, Kukah, who doesn’t seem to be oblivious of all the failures of former President Jonathan, finally came up and betrayed his intentions with yet another comment. He says former heads of state will protect Jonathan, who he claims, always put God and Nigeria first, in all that he did. At the same time, he acknowledges the mismanagement of Nigeria’s resources under Jonathan probably with the help of that same “God” that Jonathan put first in pilgrimages and political sermons in churches. Funnily, Matthew Kukah never sounded any note of warning on things that he saw going wrong under Jonathan the way he now seems to be megaphoning on Buhari. Just who is fooling who? As if that was not enough, another Catholic Priest Cardinal Okogie came out in a seeming concerted ploy to pronounce that Buhari’s anti-corruption war will yield nothing and sounded like he was in utter oblivion of the gains made so far. In a further nonsensical and outright dimwitted analogy, he cited the direction of the pointing fingers in a futile ploy to discourage the proactive anti-corruption campaign by President Buhari. This is what the Catholic Church has been reduced to in Nigeria as the conscience of the common man. While these unfortunate advocates of the devil try to make good on being the faces of Nigeria’s enemies, we allow ourselves the crucial question if Nigeria can still be salvaged. Then we hear the name of one former Governor Fashola, who has long been held in high esteem for outstanding achievements. But if achievements have truly been made on the heels of burgeoning corruption, then Nigeria’s path to salvation is still many light years away. We also hear of a Governor of Adamawa state, who is said to have justified spending bailout funds on armored SUVs in place of workers’ wages that are owed by the government. Nigeria is indeed, a nation gone completely nuts and former President Obasanjo will have to wait for many more decades to see his optimism come true and he may probably not live to see the rosy days. Your points and opinion are factual. Dear Jacob, please let us keep a standard in this debate. You do not have to descend to the level of someone who makes himself a judge of “intelligence rating” to make a point. The last election that brought in Buhari surely left a huge scar on people’s senses of imagination and belive me, many more are yet to recover from their poor sense of judgment. Joshua I can see that mentally retarded people like you are the problem with Nigeria. It looks like foreign reports about the magical performance of your dubious hero is more important than what you see on ground. Nigeria under Jonathan empowered thieves, thugs and illiterates in positions that are meant to be reputable. Thieves were never fought except those who tried to expose them. You are living in adream world and I think you may wake up after Buhari has finished his re-sanitization treatment. Academic journals are verifiable and have certain standards. If Asian universities embarked on studies showing Nigeria’s marked improvement in small and medium scale enterprises as well as rice paddy initiatives are magical perfomances then I wait for what is not magical. @Larr, I respect you so much but with all due respect, it is unintelligent to discredit a performer simply because you don’t like him. It is also worse to think that I have a poor sense of judgement because I supported a saner, better performing leader compared to the vindictive, and directionless leader we have now who could not even campaign on his own records. For the record, I was a GEJ critic, he was no saint and had he won, I would have resumed from where I left off. At least I am objective but not so with you @ Larr, your objectivity is suspect. I will give you just a few tips on how GEJ fought corruption @Jacob. Before now, it was easy for anyone to walk into FRSC and pick up 2 Drivers License in same picture but different names. It was also easy as pie to go to Tin Can and under pay the value of duty without waiver. It was also very difficult to get a measure of fertilizer in Nigeria. There are so many other sectors but someone cleaned them up; sanitized the process, put a lot of the procedure online and monies were paid straight into government accounts. Rather than give that man credit, he is condemned to all sorts of abuse. Where is your sense of fairness? Have you any? PMB is yet to have a meeting on the energy situation and I can tell you he is as ignorant as the man on the street about power generation, gas supply, transmission and all the others yet you credit him with the improvement for a frivolous excuse as “fear”. Nigeria is not perfect, but it is not a failed state like the APC and a lot armchair critics would have us believe. GEJ began strengthening institutions and making processes transparent. Information about government spending was made available resulting in Nigeria’s corruption profile decline but our rather uninformed minds insist that stones must be cast and men locked up in jail before corruption is seen to be fought. Today we have an alternative in power and without defining what corruption is has begun setting up stakes, gallows and pariah grounds for beheading, hanging and stoning. Wake up to objectivity and stop hating a man who despite his flaws played a significant role to Nigeria’s development on his watch. One word of advice: Even Adolf Hitler had many praise-worthy areas of contribution to national development. In key areas however his achievements were neutralized by major flaws. Be careful when quantifying peas to redeem the barrel of crude. You sound like a petty mind overrating his mental capacity. Elevating lower steps on a steepy staircase where central and higher steps like crude subsidies, uncontrolled looting and sectionalism held sway clearly expose the limited reach of your mental perception. Unfortunately no one can help you because you’re too deeply immersed in your conviction of being the infallible bar of human objectivity. Resign quietly to history and wait patiently for the end-game before rushing to infantile judgments on writers and leaders. Too many flaws in your perception. Just this one and final response to any comment you may further make. Cheers and thanks for commenting. After reading this piece twice, I see the facts for myself. Vilify Jonathan and hail PMB. Denounce religious leaders and condemn catholic priests for giving their candid advice to a president whose mental capability is obviously acknowledged by yourself to be in decline. We see advanced democracies where parties succeed one another yet no one engages the reverse gear seeking whom they might devour. They face squarely the task of delivering campaign promises and dealing with the issues as pragmatically as possible. For all the hate in this piece, your intelligence rating just declined as it fails a certain principle of accounting – credit the giver. President Jonathan worked assiduously on far too many sectors – power, roads, agriculture, SMEs, TAMs for refineries etc yet without laying a single stone, propaganda loving PMB apologists have given him credit. I recently read a Malay/Thai report about how much progress Nigeria recorded under GEJ – these reports were written for students in those countries and a friend let me read it yet Nigerians were led to believe that GEJ was evil. The elections are over, GEJ has lost and PMB has won. The windshield of a vehicle is larger compared to side mirrors for a reason. Let PMB face the future, that is what the over 2.5m margin gave him a mandate to do and not keep us in reverse gear. The agenda is quite clear for PMB – draw your line on corruption, name your approach. A growing economy needs stabilizing not inaction. Provide direction on agriculture/diversification; GEJ’s foundations must not be lost. Truth is, PMB is a tired old rut on a vendetta mission. Hide him all they may, his failing mental and physical health will expose him further. GEJ was no saint but he certainly does not deserve the crucifixion and stone casting especially from people who should know. 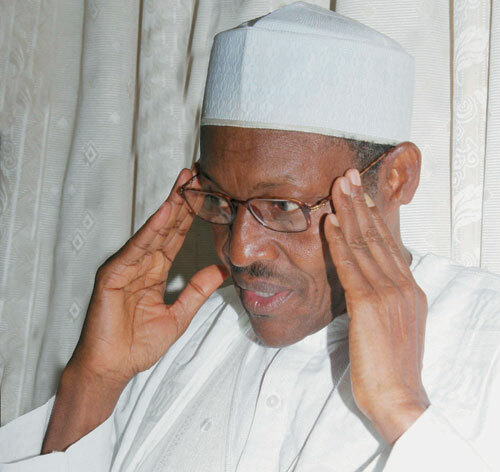 As a Christian – I pray that PMB succeeds as president but as an analyst, I see no reason to have faith in the man. This entry was posted on August 24, 2015 by Frisky Larr.